I’m not sure why I even thought to take this photo in the first place, and I’m not really sure what to think of it overall, but I do kind of like it. I was literally just brushing my teeth one chilly morning a few weeks ago when I happened to notice my son’s rubber ducky sitting on the edge of the bathtub. The sun was not yet up and the light you’re seeing is coming from the closet behind me, and I thought everything came together to form a kind of cool scene. I imagined this little yellow plastic waterfowl standing on the edge of a precipice keeping watch so as to alert the rest of his unit of any incoming enemy forces. Despite what was clearly a long, dark, and cold night this fella stood at his post and remained vigilant through the small hours of the night and would remain until the sun rose high in the morning sky. No ill would befall his friends tonight. Not on his watch. I shot this with my D750 because the light was so dim that I knew I would need a higher ISO, and a relatively clean one at that. 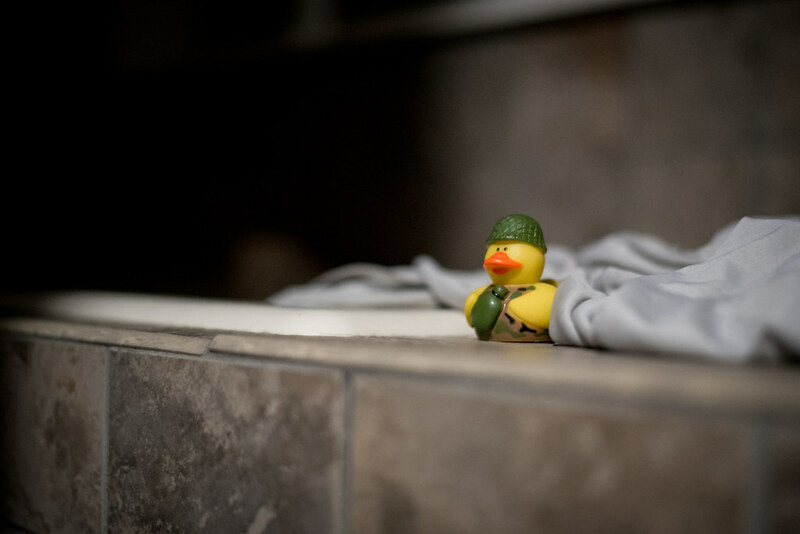 Also, I just like using any opportunity to take pictures that camera :) I don’t know if there is enough context to give you a sense that this duck is sitting on the edge of a bathtub, and I hope you don’t mind a picture with my pajamas all wrinkled up in the foreground, but if nothing else this photo brings a bit of a smile to my face. It’s probably a bit conceited to say this is a good picture but I do think it works to illustrate how you can find compelling photo opportunities in everyday life even when things seem kind of dull and boring. Of course it never hurts to get some interesting lighting conditions such as the wee hours of the morning, late at night, or on a cloudy day. In fact, I would recommend this as a possible course of action if you are ever struggling to find ways of jumpstarting your own photography: get up a bit earlier or stay up a bit later and pay attention to how ordinary everyday objects give off a whole new impression with the different lighting conditions. Thank you Myrjam! That means a lot, and I’m so glad you enjoy these photos. I’m glad you enjoyed the story, Jacqueline! I truly like your posts and how you come up with the ideas. This particular picture is a testament to your photography talent. You inspire me. You never cease to amaze me on how you are able to “find” subjects for photographs in the most unlikely of places. Of course, your point is well taken that these opportunities surround us and are there if we only look for them! I appreciate your comments on the aperture and ISO that you used. You normally don’t post photos using this much wide of an aperture. The effect of the small area of sharpness when shooting close at this fstop is something I am glad you reminded us of. Again, thank you for doing posting this blog. Have a blessed day! Thank you so much David! You know, sometimes I get a little antsy and start to think that there’s just nothing around me interesting enough to photograph. Usually that means I’m not looking hard enough!